With the science of soul fingerprinting a reality, Alina Chase has spent her entire life imprisoned for the crimes her past self committed. In an attempt to clear her name, Alina unintentionally trades one prison for another when she escapes, aided by a group of teens whose intentions and motivations are a mystery to her. As she gets to know one of the boys, sparks fly, and Alina believes she may finally be able to trust someone. But when she uncovers clues left behind from her past life that only she can decipher, secrets begin to unravel. Alina must figure out whether she’s more than the soul she inherited, or if she’s fated to repeat the past. In a society where bodies die and souls are reborn through new life, Alina Chase lives confined to the island where guards are interchangeable and forbidden to form an attachment. Her soul formerly belonged to June Calahan, the young woman who hacked the national database of reborn souls. Now Alina is punished for crimes she didn't commit because seventeen years ago, she inherited the soul of the villain of a nation. Even if she can't remember June's indiscretions, the seventeen year old is considered dangerous. It's been seven months in the making, and now Alina is on the verge of escaping her compound, putting her trust in strangers to secure her freedom. Brother and sister duo Casey and Cameron have no attachment to Alina, but need the information obtained by June to find their missing sister. But former guard Dominic has proven he cannot be trusted, when he lured Alina into a secret relationship while detained on the island. It seems all but one want something more than just Alina's freedom. She may not remember the life that June lead, but as a series of clues begin to emerge, Alina begins to realise that her freedom comes at a cost both to herself and society. June isn't the traitor the world turned against, and Alina will stop at nothing to finish what June begun. Soulprint lured me in from the first chapter, in an unexpected and engaging storyline that kept me enthralled. It follows the story of Alina, a girl who inherited the soul of June, a traitor to her country for hacking the database of a soul registry where infants were tested to scientifically determine their past life. Her life has been plagued by media speculation, that if she were ever freed, Alina would continue the work of June. With one former escape that nearly ended her meager life, now on her seventeenth birthday Alina has been given a second chance at freedom. Her lifeline comes in the form of sibling duo Cameron and Casey, who along with former guard Dominic, want more than to free the girl who lives her life within the secure compound. I keep waiting for freedom to feel like something else. Something not so disorientating. Something not so terrifying. Something more. On the run, it's clear that Dominic wants to use Alina once again for his own personal gain, Casey wants information on her missing sister and Cameron seems to be as wary of Alina as she is of him. Alina is an engaging, likable and relatable character. She's not only running for her freedom, but her inner demons in the form of June. It seems that everyone wants something from her, all except Cameron and the two form a tentative friendship whilst on the run. He doesn't see her soul as belonging to June, but rather her own. It's an intense romance where both Alina and Cameron learn to trust one another and sacrifice their own lives, of the nation of oppression and fear of their past selves. It's my second experience into delving into a world created by Megan Miranda, having read Hysteria, and I thoroughly enjoyed it. It's not only well written, but unique and a mild science fiction that will appeal to the wider audience. The soul recycling trope reminds me of New Soul series by Jodi Meadows. But I think that's where the similarities end. I'd be more invested in Soulprint, to be honest. I didn't quite enjoy New Soul, because I thought the author did too much all at once. I haven't read New Soul or seen it around really, I'll have to check it out. Thankfully this isn't too busy, whenever science fiction is involved and authors try to pack in hordes of new concepts, I end up switching off. I'm surprised my husband's Stargate senses aren't tingling at your reference. It's actually souls that are being reborn into newborn babies after the original person dies. Although it's classed a science fiction, it really could raise the topic of what happens to the soul when we die. The soul inheritance and soul fingerprinting seems like a really cool concept for a book. I've been looking for more sci-fi books to read because I love writing sci-fi, but I haven't read many sci-fi books. I really enjoy science fiction as well Ana, but as long as it's mild and fuses other genres and a little romance of friendship in there to soften the storyline. It's pretty entertaining and even being 350 plus pages, I breezed through it pretty quickly as well. Woah, this sounds both action-paced and character driven. Great! Will add with pleasure. Fantastic review! I just hope the romance will not disappoint me :P I'm having difficulties with it these past few months. The romance takes a backseat to the storyline in this one, which I found refreshing as most authors would probably force it in there as part of the main plot. There's nothing like running for your lives, only for the author to throw a passionate kiss fest in there. Makes no sense. You have completely sold me on this, Kelly! I loved the sound of it, but now I want to read about these characters and how the author introduces the idea of someone's soul "belonging" to someone else. And romance and sci-fi are always added bonuses! It's pretty unique actually, as one person dies, their soul is reborn into a child. The romance is pretty mild thankfully, but enough of a slow intense attraction as to not take away from the storyline. 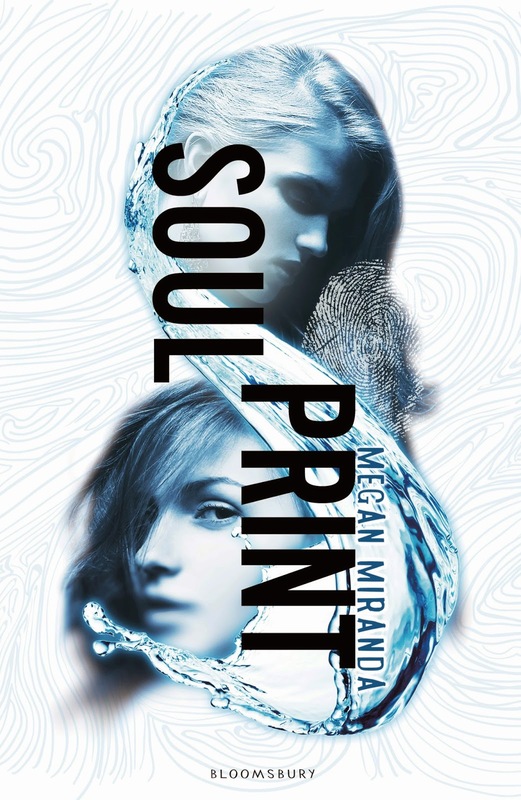 I haven't read anything by this author yet, but I read a review of this one the other day (and now yours) and I really want to read Soul Print. It sounds fascinating. I think you'd enjoy this one Lauren. It's mild science fiction with a hint of romance and no big dumps of information either. Thanks Kara. The cover is absolutely gorgeous isn't it! I really enjoyed this one, and the great thing is that it's a standalone too. Oops. Is this a sequel? I probably shouldn't have read the review but but but I DID SO THERE. I like the sound of this. It sounds epic and a little bit freaky and soooouls are cool. *nods* I'm checking this out on Goodreads. See what you've done? Making my TBR longer. Darnit, Kelly. No, it's a standalone actually. I love not having to invest in an entire series to get answers. You'll probably enjoy this one smushy. You totally would Lily. It's mild science fiction and the romance is just enough to make the characters really likable as well. It's available on Netgalley still. It was a refreshing change from the typical love triangles and instant love, that's for sure. It's a nice quick read too, despite it's length. Looking forward to seeing you getting around to reading this one Jess. Huh I've never heard of this one before! Im definitely curious now and I am loving the premise. Thanks poppet. It's still available on Netgalley I think. I was drawn in by the cover and premise secondly, but it was better than I expected. A nice, quick read when you're in the mood for something a little out of the ordinary. Wow, I haven't heard of this book before but the soul printing thing definitely piqued my interest. Glad to hear you enjoyed it Kelly! I did. It's pretty mild for a science fiction, but makes up for it in action. You'd probably enjoy this. Great review, Kelly. I'm really interesting in reading this one and plan on requesting. Hopefully I can still get a copy. I'm love the premise and am sure I'll enjoy it as much as you.